The Mares Junior Alegra, Rash Top and Reef Walker Set is a fantastic little pack for the new snorkeller who is starting from scratch and needs all of the gear. This particular set is for juniors and is of top quality. It contains the Mares Alegra mask, snorkel and fin set, the Land and Sea short sleeve rash top, Tusa reef walkers and a mesh bag to carry it all in. 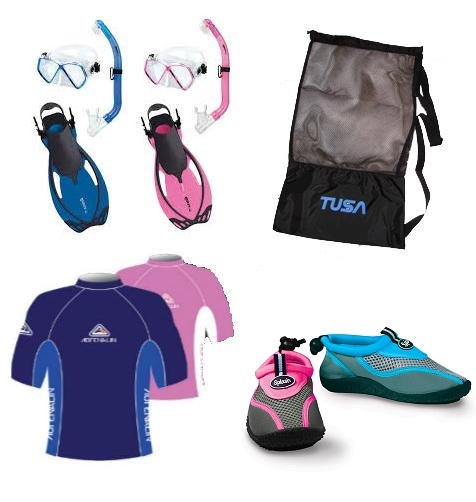 The Mares Alegra Junior Set is a junior mask, snorkel and fin set that comes in 2 sizes and 2 great colors. The mask and snorkel in this particular set will fit children faces from 3 years - 10 years approx. They are made from 100% silicone with tempered glass lens which makes the skirt super comfortable of faces and the frame and glass extremely durable. The snorkel has a purge valve underneath the mouthpiece of allow any excess water to be blown out rather than having to blow it all the way to the top of the snorkel. A wash over sits on the tip of the snorkel which prevents water from entering the snorkel when there are waves or splashing. The Alegra Junior set comes in 2 sizes, Small/Medium and Large/Xlarge. The foot size of your child will determine which size to get as the masks and snorkels are all the same size. Small/Medium suit foot size 9-13 US and Large/Xlarge suit foot size 1-4 US. Worn with bare feet. 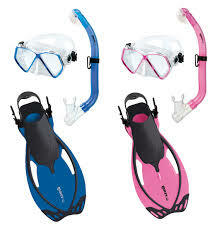 Available in 2 great colors, Pink and Blue, you really can go past the fantastic junior snorkeling kit. The Land and Sea Short Sleeve Junior Rash Shirts come in sizes 4 - 14 years. Available in Pink and Blue, this item is something every child needs, especially n the Australian climate. Sun protection is something that is drilled in to us as young children, slip, slop, slap!! You all know it! 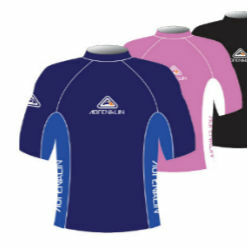 These 50+ UPF rated sun shirts are of top quality and are chlorine resistant too. The lycra allows you to stay cool in the sun, yet not be heavy when in the water and the non rashing construction mans there is no rubbing or chaffing under the arms. The L&S Junior Splash Aqua Shoe is a junior reek walker that starts in a size child 6 and goes up to a junior size 3 and come in 2 great colors, blue and pink. 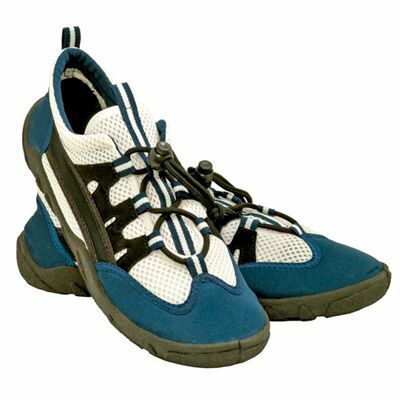 They are a super light weight comfortable water shoe with a sturdy traction sole that comes up around the sides for extra protection when walking on rocks, coral or anywhere where there is water. These can be worn at water parks, around the pool or the beach for comfort and prevention of sore feet, They have a easy to pull on tab on the top of the show and an adjustable toggle behind the ankle to get the best possible fit. They mesh on the top of the shoe allows for water drainage and air flow. 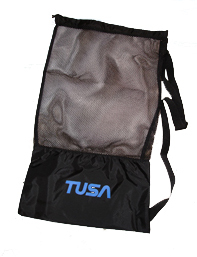 Being made of neoprene, they dry quite quickly and are perfect for those family holidays.